How do you deal with the winter blahs? It always happens. It's cold outside, dark waaaaay too early, and the magic of Christmas has all but worn off. We've had snow, a little thaw, and a little coating of ice. It's helped to make most everything soggy and gross. Even the yard feels ugly, or at least it would if the yard could feel. I needed a pick-me-up. 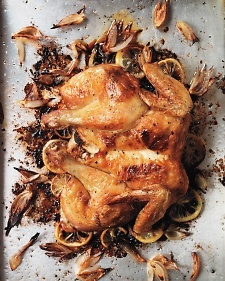 Who knew that would come in the form of a roast chicken? Martha did. I tried out a new recipe from the January issue of Martha Stewart Magazine. I made Roast Spatchcocked (I can't say it without snickering because I am forever 10 years old) lemon chicken. It was so good, even though I don't think I'm tasting too much. I LOVE lemons and found some meyer lemons & shallots that made this super tasty. Cutting out the backbone to make it lay flat was an experience. It felt a bit barbaric! Well worth the effort, though. I'm shredding leftovers for spinach salads for tomorrow's lunch. It was really very easy and SO delicious! I wish I would have taken some photos of the process, but as it so often happens, I'm half-way through the process when I remember to get out my camera..or phone. So, until I can get to somewhere sunny and warm, this dish will serve as a way to make dinner a little lighter and a little brighter. Try it out...you'll be glad you did!